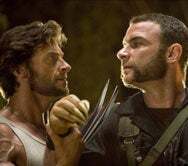 Wolverine (Hugh Jackman) and Sabretooth (Liev Schreiber) argue over the lack of VBA support in Office 2008. Or so I’d like to imagine. Look out, Microsoft—you’ve gone and made Sabretooth mad. Liev Schreiber: So annoyed that I moved to a Mac. What I wouldn’t give to watch Sabretooth make short work of Clippy. You can listen to everyone enjoying a cruel laugh at Microsoft’s expense on the Wait Wait Web site—just scroll down to the Not My Job segment. Or, you can go to the show’s iTunes Store page and download the May 2 episode for yourself.